For these books Rahlfs-Hanhart prints one textual tradition at the top of a given page, followed by a dividing line, followed by the other textual tradition at the bottom. Each has its own text-critical apparatus. Göttingen Tobit does the same. This solution works well enough in those editions. However, for our Reader’s Edition, we needed to take a different approach than that of Rahlfs. Stacking the double texts on one page, each with its own vocabulary apparatus, proved to be an unsightly mess and a sub-optimal reading experience as we conceptualized it. As with everything in this project, it took a lot more thinking and beta-testing to get it right than we ever imagined! 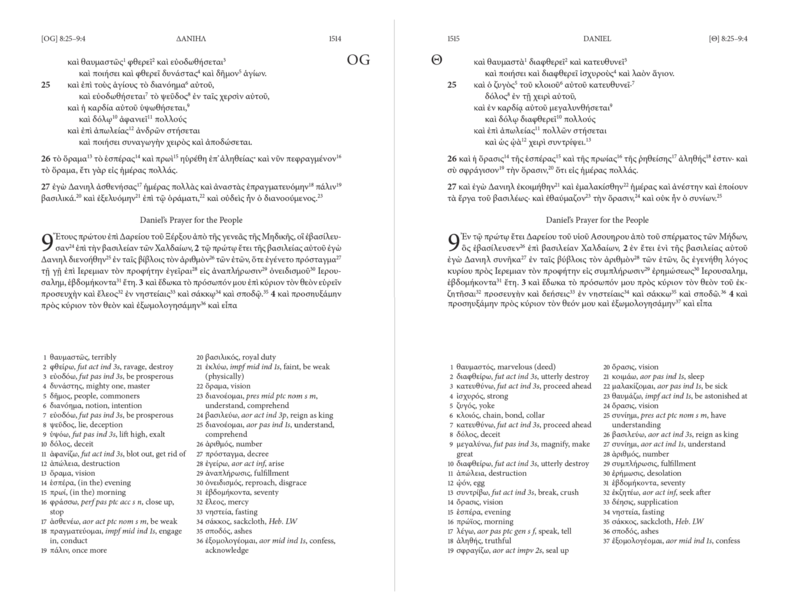 We settled on printing the two textual forms (for the sections mentioned above) on facing pages, similar to Göttingen Daniel/Susanna/Bel. Where the texts allowed we aligned the corresponding passages as closely as possible; in general this was straightforward, though in spots where the textual traditions deviate quite a lot in content (even in their versification), we simply did the best we could to make it work visually. Each of the facing pages, then, has its own vocabulary apparatus just like any other page. When the same word is used in each text, we did our best to match the glosses unless it did not make sense to do so. The same applies to the English sub-headers. We also experimented with several options for visually differentiating the two text forms, so that the reader knows which textual tradition they’re reading on the left-hand side versus the right-hand side. Thanks to some hard work by the Hendrickson team, we arrived at marking such pages on the inside margins (the gutter) with a large letter corresponding to the textual tradition on that page. Anything more than that proved to be too distracting to the reader. We also, consequently, had to deal with situations where we needed to start a new book on an even page (right-hand side) but were in a double text scenario and could not do so (since, if you’re tracking with us, such a scenario would break the left-right approach). In those cases, we inserted a divider page explaining that the next (odd-numbered) page begins the new book with double texts on facing pages. * In some cases, the double texts are (or will be) handled differently in the ongoing Göttingen critical edition of the Septuagint. For example, the current editor of LXX-Judges has enough additional evidence at his disposal that he is reconstructing a single Old Greek text. Reblogged this on Words on the Word. I’m putting this on the LXX reading group on Facebook and my Greek blog. Thanks. V. nicely done (and great choice of fonts).